Children's favorite Bengali thriller or mystery story book 'Gourer Kabach', it is an another miraculous creation of Shirshendu Mukhopadhyay. 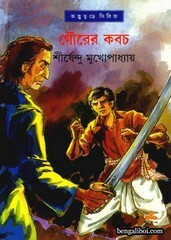 The book published by Ananda Publishers and it is Shirshendu's weird (Adventure) Series. It is one of the most remarkable and popular children or teenage novels of his writing. The ebook pdf has 108 HQ pages, 7mb file size. Collect the Bengali teenage story book as pdf download- 'Gourer Kabach by Shirshendu Mukhopadhyay'.